A blistering, frenetic dive into a world where nouns verb, spoons philosophize, and high-end bottled drugs find themselves haloed. 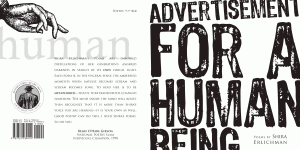 Advertisement for a Human Being was perhaps the epitome of Destructible Heart surrealism. While we expect every copy of Advertisement will be worth quite a lot in ten years, 45 copies with a misprinted cover went into circulation in Summer 2007; if you have one, you might want to ziplock it out of the sunlight. And cross your fingers eBay’s still going strong in a few.